Canada’s most-viewed program, The Big Bang Theory has been picked up for three more seasons, giving CTV more opportunities to launch Canadian programming following the laugher’s 8 p.m. Thursday night time slot. So far original airings of the program have brought in an average audience of 4.4 million viewers for the fall of 2013. The Big Bang Theory, which targets adults aged 18 to 54 most recently kicked-off the new Dave Foley-starring PR comedy Spun Out, which premiered following Big Bang and is being brought back to the 8:30 p.m. slot for the final two weeks of March. Spun Out‘s premiere brought in an average of 1.4 million viewers for its debut and dropped to 802,000 the following night for its regular time slot on Friday. On average, Bell Media representatives say that shows following Big Bang keep 50% of its lead-in audience. Phil King, president of programming and sports at CTV, tells MiC that Big Bang‘s massive weekly audience has enabled the Bell Media channel to host a string of Canadian programming like Saving Hope in the 9 p.m. slot and Motive at 10 p.m. that night because of the large lead-in it gets from the CBS laugher. He adds that he would like to use the time slot following Big Bang to launch other Canadian programming in the years ahead, with rumours that its typical time slot pairing Two and a Half Men might only get a half season next fall. King adds that it isn’t often that a channel gets a show with the reach of Big Bang across audience segments, adding other examples typically fall in the reality segment. Maclean’s is expanding its political coverage to radio. The Rogers-owned current affairs brand will debut Maclean’s on the Hill, a new comment and analysis show featuring political journalists Paul Wells, John Geddes and Aaron Wherry (pictured), on Rogers talk and news radio stations across the country Saturday March 22. Maclean’s also recently unveiled its redesigned responsive website following a push by Rogers Publishing to move all its websites to responsive design. The move has seen page views increase 35% and pushed mobile and tablet usage up 63% across Rogers properties, according to a release. Chatelaine, another Rogers-owned magazine, recently expanded its radio presence recently with a cross-country Valentine’s day episode of the Chatelaine radio show. The Edge launches new lineup - Lots of changes. Corus Radio Toronto’s 102.1 the Edge, has announced a diverse new weekday lineup of on-air personalities to bring the best of music, pop culture, irreverent humour and topical engaging entertainment to audiences. The new station roster makes its debut Monday, March 31. Morning drive will be hosted by Dominik Diamond, Josie Dye and Greg Beharrell from 5:30 a.m. to 10 a.m.
Dominik has extensive international experience as host at BBC London and BBC Scotland. Most recently, Dominik hosted The Dominik Diamond Morning Show on Halifax’s Radio 96.5 and prior to that was the very popular evening host on the Edge’s brother station Q107. Josie is no stranger to the Edge. She has been the station’s midday announcer and host of the nationally syndicated Josie’s Top 20. She has also been the host of Oh So Cosmo on Cosmopolitan TV. Greg is a writer, comedian, performer and multiplatform content creator, who currently hosts the evening show on the Edge and is a video contributor to the world famous funnyordie.com. Middays will be hosted by Carlos Benevides from 10 a.m. to 2 p.m. Carlos, a former Edge announcer, comes from Corus Radio Kitchener’s 91.5 the Beat, where he is currently the morning show co-host on The Beat Breakfast. Afternoon drive will be co-hosted by “Fearless” Fred Kennedy and Melani “Mel” Mariani from 2 p.m. to 7 p.m. Fred joined the Edge in 2009 and has since been the station’s afternoon drive host, as well as host of TELETOON’s Fred at Night. He will be joined by new co-host, Mel, who has been featured during the weekends on the Edge. Evenings will be hosted by Adam Ricard from 7 p.m. to midnight. Adam is a weekend veteran of the Edge and has frequently hosted live concert performances and artist interviews for the Edge’s Sugar Beach Sessions at Corus Quay. Tune in to 102.1 the Edge on the FM dial or listen live at www.edge.ca. Farber aims to position radio as a reach medium that builds brands. The Radio Advertising Bureau doesn’t forecast revenue but RAB president Erica Farber says there’s reason to be optimistic when radio’s position is looked at on a global scale, where corporate America’s marketing budgets aren’t growing. “It’s still a positive for us when you consider how many new entrants there are that we’ve held our own,” she says. As the industry crafts its story for advertisers, she believes it should position itself as a medium that builds brands rather than just a vehicle to deliver a “price and item” message. “Radio never positioned itself as a reach medium,” Farber says. “And yet what PPM has shown us is that there are more people listening to us than we ever thought and it’s proving that radio is a great way to develop a brand and that is a major shift as far as positioning our medium.” In the nearer-term, it appears 2014 has begun with still no strong direction evident. Some public companies have said winter weather is weakening sales, and Farber says, “When we start to see first quarter results there are going to be some major challenges because the weather has slammed advertising.” Clearly, the winds of change are still blowing for radio. TSN is making sports available on the go. The Bell Media sports specialty channel today announced its new live streaming service TSN Go, which enables Bell TV and Rogers Cable customers who subscribe to TSN to watch its programming live and on-demand via their computer, smartphone or tablet. The service promises 6,000 hours of live sports programming from both TSN and TSN2 each year, including the Grey Cup, the World Junior Hockey Championship and NCAA March Madness. The service is also making episodes of fan-favourite shows including Off the Record and That’s Hockey available. Radio’s in the media mix for Millennials but user-generated content tops the bill. Radio’s bread and butter are 25-54 year-olds, the demo most formats shoot for and most advertisers covet. But Millennials, all 77 million of them, are waiting in the wings. In fact millions of Millennials have already entered the crucial 25-54 demo and more do so every day. Millennials, also known as Gen Y, are forecasted to have record-breaking purchasing power. Radio’s still very much in their orbit but, like all traditional media, takes a back seat to the Big Kahuna of the Millennial media mix: user-generated content (UGC). Fully 30% of Gen Y’s daily media time is spent with content that is created by their peers, according to new research by social influence marketer Crowdtap and market research firm Ipsos. That’s more than is spent with such Millennial-friendly activities as browsing the internet (20%), watching live TV (10%) or playing computer or video games (10%). Millennials find UGC content 35% more memorable than other sources. Still, Millennials spend 7% of their media time with radio. While that may sound low, Gen Y packs 18 hours of media time into their day, often viewing multiple devices simultaneously. That adds up to one hour and 16 minutes a day with radio, a little less than what Nielsen found it its recent Cross-Platform report: one hour and 33 minutes a day for 18-24 year-olds; 1 hour and 43 minutes for 25-34 year-olds. 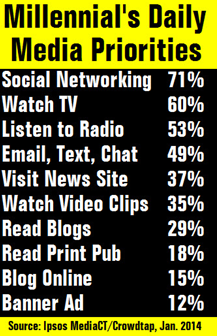 Millennials prioritize social media at the top of their media stack: 71% use social networking on a daily basis. Radio came in third place on their media priority list with 53% listening to either broadcast or streaming radio daily, behind live TV at 60%, but ahead of email/text; retrieving news, weather and sports scores; and pre-recorded TV. Survey: ‘Consumer to consumer marketing’ drives trust among Millennials. As Millennials occupy a larger position on radio’s radar screen, broadcasters will need to come up with different solutions to effectively communicate client messages to them. The old rules may no longer apply. Millennials report that in¬formation they receive through user-generated content is highly trust¬worthy and trusted 40% more than information they get from traditional media sources like TV, print and radio. That’s according to new findings from market research firm Ipsos and social influence marketer Crowdtap. Conversations with friends and family are trusted two-to-one over TV and radio and almost four-to-one over banner ads. “Brands looking for consumers to trust their marketing can no longer rely on tradi¬tional media to communicate their messages to consumers,” the study’s authors say. “In today’s landscape, it’s peer-created content, or ‘consumer to consumer marketing,’ that drives trust.” Crowdtap and Ipsos surveyed 839 U.S. men and women aged 18-36 in January. TORONTO (March 3, 2014) – Canada’s Sports Leader delivers all the news and analysis surrounding NHL Trade Deadline Day during TRADECENTRE ’14 (#TradeCentre) – TSN’s signature 10-hour event. Consistently ranking as the industry’s most-watched and most-trusted source for NHL Trade Deadline Day news, TRADECENTRE ’14 airs Wednesday, March 5 beginning at 8 a.m. ET on TSN. Before kicking off TRADECENTRE ’14, TSN’s team of Hockey Insiders and experts set up one of the most anticipated days of the hockey season during the 60-minute COUNTDOWN TO TRADECENTRE airing tomorrow (Tuesday, March 4) at 8:30 p.m. ET. From 8 a.m. to 6 p.m. ET on Wednesday, TRADECENTRE ’14 delivers in-depth coverage of every trade. For fans at work or on-the-go, the entire broadcast will be available via live stream on TSN.ca and on the brand new TSN Hockey app. TRADECENTRE ’14 will also be available live on NHL Network in the U.S. Immediately following TRADECENTRE ’14 on TSN, host Rod Smith recaps the day’s events with reaction from around the NHL on SPORTSCENTRE at 6 p.m. ET while NHL ON TSN takes over at 7 p.m. ET with Toronto @ NY Rangers. Host James Duthie leads TSN’s TRADECENTRE ’14 team of Hockey Insiders and experts – including former NHL players, coaches, and general managers – through 10 hours of hockey talk. Throughout the day, TRADECENTRE ’14 will feature interviews, breaking news and instant analysis of each transaction, while also checking in with SPORTSCENTRE’s Bureau Reporters on site with each Canadian team to file live reports. RAM has signed on as lead sponsor of TRADECENTRE ’14 and the Trade Breaker Desk, helmed by TSN’s Hockey Insiders. Launching just in time for TRADECENTRE ’14, the fully customizable TSN Hockey app delivers real-time game updates, news alerts, video highlights, and more from Hockey Canada, NHL, and AHL. Designed and engineered in partnership with the Toronto-based digital studio The Working Group, the TSN Hockey app is available on iOS and will soon be available for Android. · Trade Tracker – delivering real-time updates on all the trades as they happen. In addition, TSN’s social media team keeps fans in the loop on TSN’s official Twitter, Facebook, and Instagram accounts with real-time content related to the biggest trades. The TRADECENTRE ’14 broadcast will also feature fan tweets using the hashtag #TradeCentre within the TradeCentre Twitter Bar. For in-depth local coverage of NHL Trade Deadline Day, fans can listen to TSN Radio stations across the country: TSN Radio 1050 in Toronto, TSN Radio 690 in Montreal, TSN Radio 1290 in Winnipeg, TSN Radio 1200 in Ottawa, TSN Radio 1260 in Edmonton, and TEAM 1040 in Vancouver. Live streaming of TSN Radio is also available on TSN Digital platforms. Each station features coverage focused on the local NHL team in their market and dips in and out of live coverage of TRADECENTRE ’14 – with the television broadcast also featuring look-ins from select TSN Radio stations. TSN is Canada's Sports Leader and #1 specialty network. With a broad portfolio of multimedia sports assets, TSN delivers world-class content across industry-leading platforms including TSN2, TSN.ca, TSN Radio and TSN Mobile TV. Official broadcaster of the Grey Cup, IIHF World Junior Championship and FIFA Women’s World Cup Canada 2015, TSN’s slate of live sports coverage includes NHL, CFL, NFL, NBA, MLS, Season of Champions Curling, UEFA Euro 2016, MLB, Barclays Premier League, Golf’s Majors, NASCAR Sprint Cup, Nationwide and Canadian Tire Series, F1, Grand Slam Tennis, NCAA March Madness, and Skate Canada events. TSN is a division of Bell Media, which is part of BCE Inc. (TSX, NYSE: BCE), Canada’s largest communications company.